Always the wedding planner, never a bride, Elliot Lynch is famous for orchestrating the splashiest weddings in Charleston, South Carolina. When her father's sloppy management practices leave them on the brink of bankruptcy, Elliot will do whatever it takes to save the family business. When asked to appear on 'The Marrying Type', a reality TV show about the people behind the scenes as couples exchange I dos, she says yes to the invasion of privacy (and the hefty paycheck that comes with it). With a camera crew capturing every detail of her life, Elliot faces her most challenging contract yet: planning a wedding where her ex is involved in every part of the process. Add in a lazy assistant, liquor-loving bridesmaid, and rival planner encroaching on her turf, and Elliot's wedding season goes from high-end to high-stress. I would like to thank the author, narrator or publisher for voluntarily providing this free review copy of this audio book. The narrator’s charactor’s voices are nasal, strident and a turn off. The southern accent is totally off. No old Charleston person sounds like East Tennessee. I will not start a book with this narrator again. A beautiful tribute to Jane Austen's Persuasion, it was a sweet story that helped you see a wonderful modern version of my favorite novel. I love JAFF but rarely I find any that I enjoy based on anything other than P&P. This author did a great job with modernizing Persuasion. I hope more Persuasion-based JAFF is released on Audible soon. Good storyline and I enjoyed listening to this audiobook. This is a great book written by Laura Chapman and narrated by Emily Lawrence. Always the wedding planner, never a bride, Elliot Lynch is famous for orchestrating the splashiest weddings in Charleston, South Carolina. When her father's sloppy management practices leave them on the brink of bankruptcy, Elliot will do whatever it takes to save the family business. When asked to appear on 'The Marrying Type', a reality TV show about the people behind the scenes as couples exchange I dos, she says yes to the invasion of privacy. With a camera crew capturing every detail of her life, Elliot faces her most challenging contract yet: planning a wedding where her ex is involved in every part of the process. Add in a lazy assistant, liquor-loving bridesmaid, and rival planner encroaching on her turf, and Elliot's wedding season goes from high-end to high-stress. The narrator Emily Lawrence did a wonderful job with this book. She did a great job with the different voices of each character in this book. It was very easy to listen to and I didn’t want to stop listening until the end. Would you listen to The Marrying Type again? Why? Yes! This has quickly become a favorite in the second chance romance category of my books. Elliot. I loved her determination but also how relatable she is in so many ways. I laughed at the bachelorette party... hello officer. But I really liked the slow bloom of a romance rekindled between Elliot and Eric. This story was slightly different than I expected. While there were some conflicts, some unappealing characters and so drama rich moments, they were never over the top or too angsty. The rekindled romance had a slow burn but remains PG, and I felt could do for a little more steam, but is a sweet contemporary romance over all. I received this audiobook for free from audiobook boom for my unbiased review. A very sweet romance with brides, grooms, bridesmaid from "you know where," a wedding planner and many twists turns ups and downs and best of all love............oh not to mention a camera crew filming it all. The narration was well done.The characters were well portrayed. Emily Lawrence does the perfect southern belle. Would you try another book from Laura Chapman and/or Emily Lawrence? 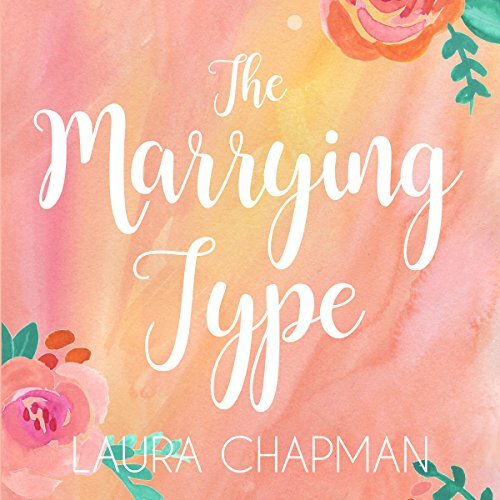 The Marrying Type is a sweet romance book to pass the time with. I enjoyed the concept of a reality show following couples on their journey to a life together. The second chance love story was also nicely written. Which character – as performed by Emily Lawrence – was your favorite? Emily is a great narrator and each character stood out, but Elliot was a strong woman who did the right thing in returning home to run the family business. She gave up on love and put her own desires on hold for her family. I admired her for it. I liked Elliot's portrayal as a competent woman who supported Eric in his efforts to make it big in business. She was the driving force behind him!